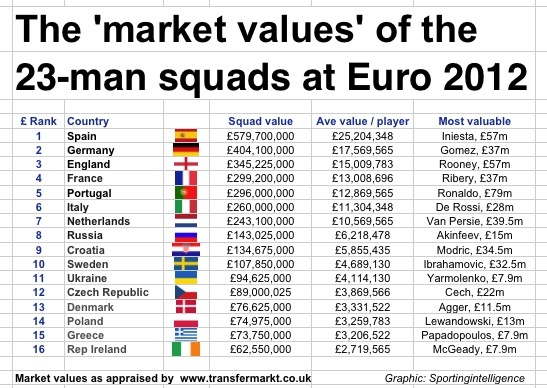 Spain have the highest ‘market value’ squad of 23 players at Euro 2012 according to assessments by Transfermarkt. Vicente Del Bosque’s reigning world and European champions, who beat France 2-0 on Saturday to reach the semi-finals, are collectively worth £579,700,000, according to the estimates. With the rider that any assessment of player value is bound to be subjective to an extent, Transfermarkt’s figures at least have the benefit of being compiled by the same people using the same subjectivity across all squads. Often the figures are the same or close to the value that a player was last traded at. But many players won’t necessarily have been traded in their careers, or been traded recently. Spain’s total squad value equates to an average value per player of £25.2m, with Andres Iniesta rated as the most valuable at £57m. The 28-year-old midfielder has been at Barcelona for 16 years so there is no recent ‘trade’ by which to measure his ‘real’ market value. Germany’s squad is deemed next most valuable at £404m, or £17.6m per player, followed by England’s, at £345m (£15m per player) and then France’s (£299m), just ahead of Portugal’s (£296m, or £12.9m per player). Portugal’s total and average value is inflated by the £79m presence of Cristiano Ronaldo, but then the Real Madrid man has already shown in the tournament why he is a stand-out talent. Three of the most valuable five squads have reached the last four (Spain, Germany, Portugal) before England face Italy (6th most valuable squad) on Sunday evening in Kiev. To view the value of every single individual player, follow this link to the European map, then click on each country to get the squad. England entered the tournament perceived very much as underdogs, at least by many of the England-supporting public in the UK. The neutral market assessment of their value indicates the sum of their parts should always have seen them emerging from their group ahead of France, Sweden and Ukraine, as indeed they did. Using Transfermrkt’s methodology, Barcelona’s squad is worth £520m, and Real Madrid’s is worth £475m. (More at this link). Manchester City have the most valuable squad in the Premier League (£435m) followed by Manchester United (£375m) and Chelsea (£345m). (More here).